All I can say is - OMG what a disaster! I am referring to the choice of venue for Diane Von Furstenberg’s 5 PM show yesterday. In one fell swoop, the designer and CFDA President literally made Lincoln Center seem like the good old days. Diane switched to the Spring Studios on Varick Street this season, in honor of the 40th anniversary of her iconic wrap dress (hence the name of the collection: “Bohemian Wrapsody”). She said she thought a change would be fun to mark the milestone and it was to be a one shot deal. Well really; its one thing to make a change for the better, a change that makes sense on several levels. It’s quite another to make a change for change’s sake, and I’m sorry to say but in this case, it was a big mistake, as I predicted. I know I sound like a broken record in my dislike of this downtown venue (and I happen to live downtown) but I really don’t understand the appeal of this spot and I don’t think that it has much going for it except for perhaps, the large windows which offer a view of the sky and the top of some downtown buildings (so what else is new?). It’s not close to anything else and it’s not particularly attractive or atmospheric. As I have previously stated, I dislike venues that rely on small elevators taking guests up and down (especially because I am claustrophobic). I like to get in and out quickly and prefer to not have to queue up on line to be packed into a lift. And I can tell you that I was hardly alone in my consternation. As hordes of invited guests (including major magazine editors), were crammed like sardines in the lobby (which by the way, has all the wonderful ambiance of a public school cafeteria), I heard many voicing their opinion saying they much preferred Lincoln Center. It was chaotic, disorganized, and I have to say, a bit scary. Talk about going from bad to worse. If Diane, Francisco Costa, Michael Kors, etc. (all who have switched to this venue for their fall 2014 showings), think this an improvement, I have news for them. It isn’t. (In the case of Francisco, who always showed in a West 39th Street ground floor space, he started using Spring Studios last season). It sort of reminds me of the days long ago, when the fashion flock was routinely getting stuck in elevators, plaster was falling from the ceiling, and show attendees were scrambling from one showroom to another all over town. 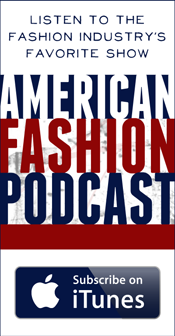 Fashion Week was then organized and centralized to make things easier and smoother. It seems we’ve come full circle and nowadays, centralization (and Lincoln Center) is perceived as uncool and unhip. Maybe the thinking is that if you show in a hip place like Tribeca, that will automatically impart a certain "je ne sais quoi" to your label. And perhaps, the more out of the way and hard to get to, the better. I think people just don’t realize what they have until they no longer have it. For me, heading back up to West 26th Street for Ralph Rucci at 8 PM, and having to take the subway as there were no cabs on what turned out to be a snowy Sunday evening, I longed for seasons past when both designers showed at Lincoln Center. Okay, so I got that off my chest. 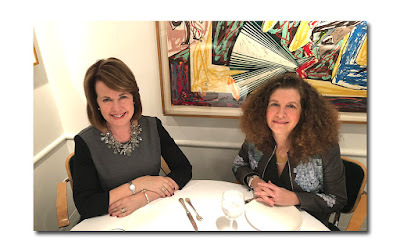 Coincidentally, my day started out by being crammed in an elevator (a nightmare for me as I keep saying), but things were quite different; I was heading to see the fall collection of Spanish label Delpozo, at the Skylight Limited on West 55th Street. The bright open lobby was quite serene and uncrowded and the elevator ride to the sprawling 37th floor was mercifully quick. The view from the massive floor to ceiling windows on what was a bright sunny morning was spectacular and I could almost see my apartment which is near the World Trade Center. More importantly, the show, which included music from a live band called Cuddle Magic (they are six multi-instrumentalist singers and songwriters who like to play quietly and close together which is why they are called Cuddle Magic) was and unlike anything else that has been shown thus far. Creative Director Joseph Font, a former haute couture couturier, may not be a household name, but is gearing up to become one. 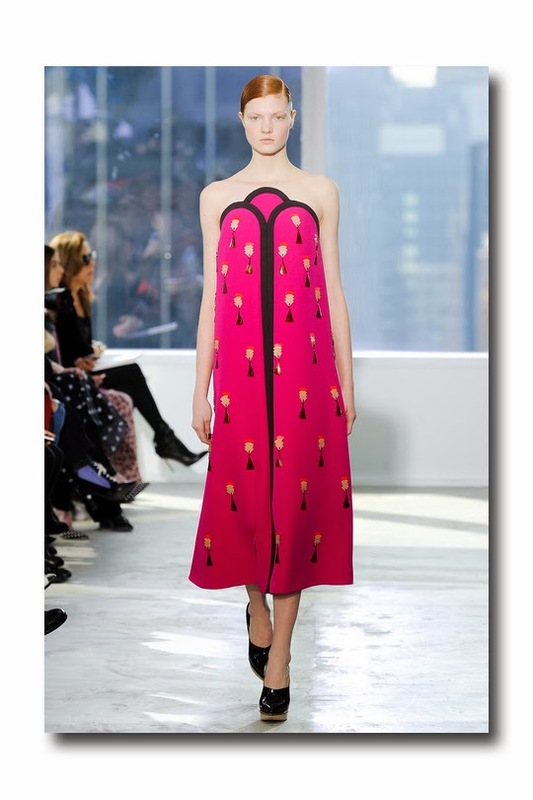 He was recently profiled in The Wall Street Journal, “Behind Delpozo's Growing Cachet Spanish Brand Leaps Onto Global Fashion Stage” by Christina Binkley. The collection, inspired by the work of Italian artist Duilio Barnabe and the retro futuristic aesthetic of the novel Logan’s Run, is all about contrasts, rich fabrics, beautiful if not unusual color combinations, the artistic employment of geometric forms, an emphasis on volume, and an a line silhouette. Each piece was shown to its best advantage: in its purist form. There was a regal sophistication that was extremely couture; but with a youthful verve. (Too bad there was no run of show, because without one, I could not correctly identify the fabrics). Of course when you say haute couture and American designer, the name Ralph Rucci immediately comes to mind, and as I noted, Ralph showed yesterday evening, in his new atelier on West 26th Street. It was hard not to notice that even though it was snowing outside, many of his guests arrived impeccably dressed in his designs, several dripping in sable, accessorized with high heeled Manolo Blahnik pumps. (This was not a Hunter Wellie and down parka crowd). I had the privilege of sitting next to his amazing 85 year old father, Manny (he and Ralph look exactly alike and Manny could pass for someone 20 years younger by the way). This was one of Ralph’s most pared down, to the point, and least fussy collections to date. It was even a bit tough and edgy (down to a touch of rock and roll in the soundtrack). 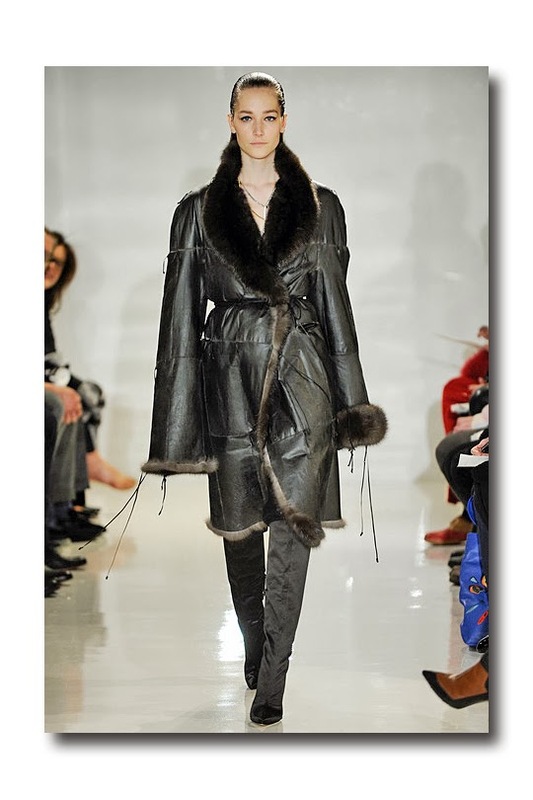 There was not one Infanta and formal evening was de-emphasized in favor of day wear, which included a gutsy and slightly over sized belted black nappa leather coat trimmed with Barguzin sable, and a perfect black quilted moire and cashmere riding jacket and matching pants. Once again, the ‘simpler’ (and I say that jokingly because nothing about Ralph’s design process is simple even if it looks that way) pieces were the ones that were most satisfying: it’s really about Ralph refining his stable of exquisite trademarks. 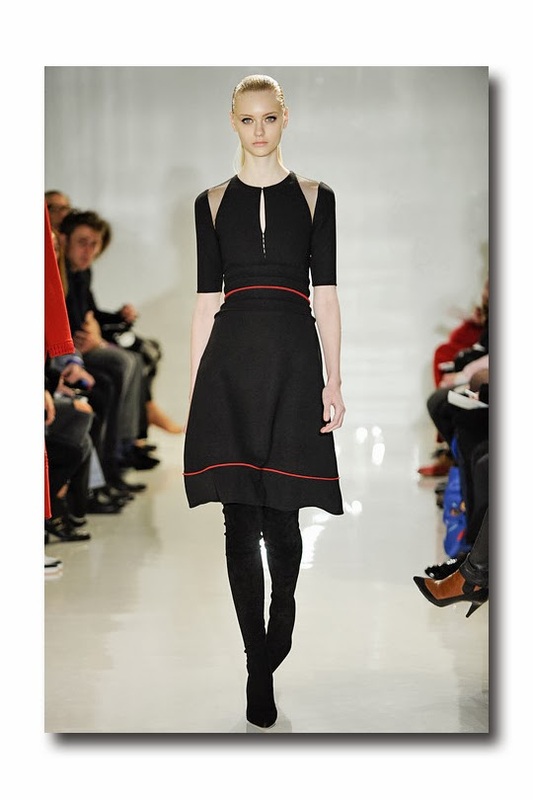 Dresses, (in a variety of lengths, all shown with high heeled over the knee boots), and dresses with coats, stole the show, and while there was a smattering of ruby and artichoke, THE most effective color was black (Ralph once admitted that he could do an entire collection in noir). There was articulated duchesse satin; embroidered leather; silk crepe with shadow insets, shards, zippers, basket weave techniques; and wool jersey with harness details or panels. 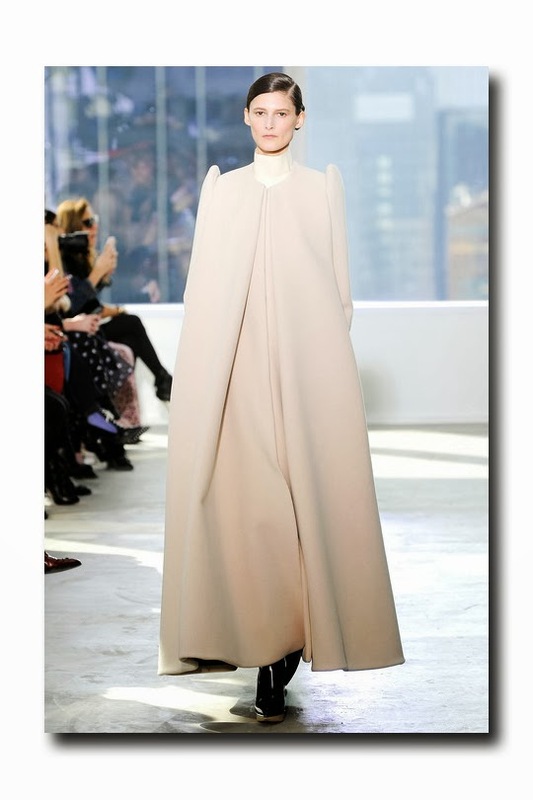 Another theme was the use of elongated tunics shown over pants, and of course, what would a Ralph Rucci collection be without alligator, ermine, sable, and mink (the latter was computerized to make a coat and a pullover sweater). 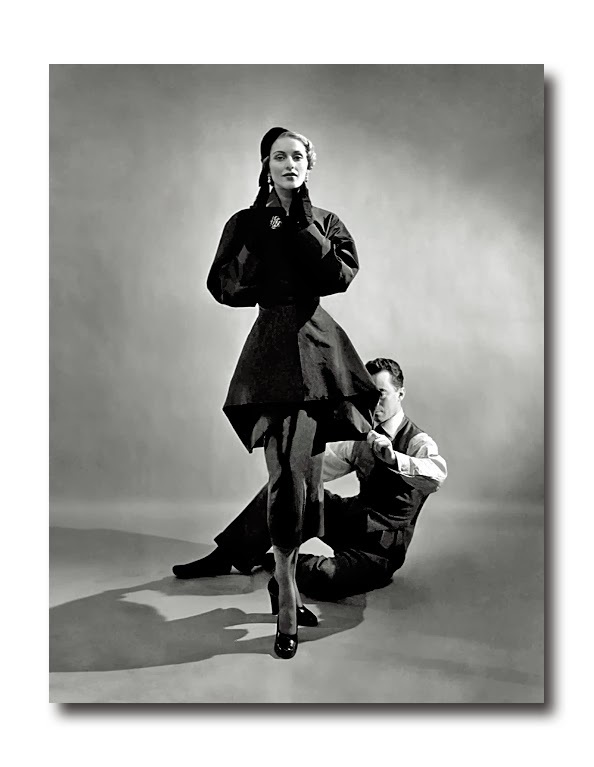 By the way, all this talk about American designers and couture could not be more timely since Charles James, one of the greatest couturiers and one of a few Americans to have worked in the tradition of the haute couture, is on everyone’s mind these days. Early this morning, there was a press conference about the new Costume Institute and the inaugural exhibition, Charles James: Beyond Fashion, May 8 – August 10th 2014. In attendance was Thomas P. Campbell, Harold Koda, Oscar de la Renta, Aerin Lauder, Lizzy and Jonathan Tisch, and Anna Wintour. 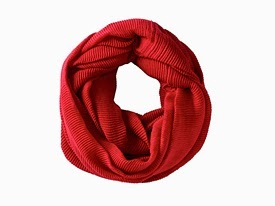 Scarves have become a necessity this winter, for protection from the chilling winds; and this infinity loop scarf is made of a pleated fabric that can transition right into spring. It comes in a variety of colors, including a vibrant red that is perfect for Valentine’s Day gifting. 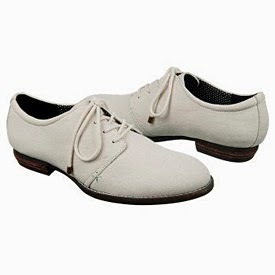 Believe it or not, spring is only weeks away, and these classic oxfords will complement a multitude of outfits. They’ll also keep your feet comfortable, thanks to the cushioning insole with Memory Fit foam. 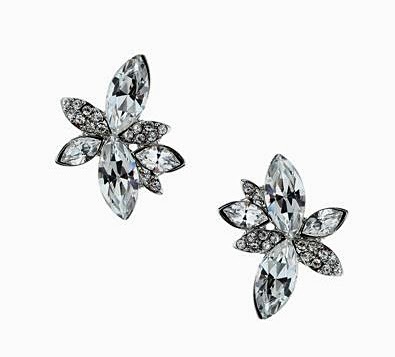 The crystal petals of these flower shaped earrings provide just the right amount of sparkle for a special night out on the town.